In another example of the critical role that vitamin D plays in human development, it has been demonstrated now that children with low levels of this key nutrient develop allergies. Vitamin D is relatively difficult to obtain from food (mostly fish) but we make it in our skin when irradiated by sunlight. Skin color variation is directly related to this necessity. In the past lack of vitamin D in children (or their mothers) has been linked to rickets, incorrect brain development, autoimmune diseases and other immunity related problems. Allergies also fall within the problematic of inappropriate immunity and can well be considered autoimmune diseases, even if often mild and with very specific triggers. Ref. Shimi Sharief et al., Vitamin D levels and food and environmental allergies in the United States: Results from the National Health and Nutrition Examination Survey 2005-2006. Journal of Allergy and Clinical Immunology, 2011. Pay per view. On the contrary the same skull-measuring method suggests that there was at least partial replacement in the Balcans and Central Europe, where other archaeological and archaeogenetic evidence also supports such population replacement. No information is provided for the Cardium Pottery area from Bosnia to Portugal but, considering the archaeological and genetic evidence I’d bet a lot that there was only localized population replacement as well, specially as one moves westwards. Also no information is provided for Atlantic Europe but again I daresay that there is a strong case for demographic continuity here as well. The results show that while the initial transition to agriculture in central Europe was the result of migrating farmers from the Near-East and Anatolia, agricultural practices were adopted by indigenous hunter-gatherer populations in outlying regions of Europe. Therefore, instead of employing two competing and mutually exclusive models of biological versus cultural diffusion, a mosaic model of both biological and cultural diffusion is a more appropriate model for this demographic change across Europe as a whole. Totally agree with this last part. I always found totally annoying that results from Germany and Poland would have to be extrapolated to the whole of Europe when the cultural dynamics were so different in the various regions and periods. This underlines a basic lack of multidisciplinary education on the part of researchers, specially some quite pretentious geneticists. The paper is authored by Irish researchers Ron Pinhasi and Noreen von Cramon-Taubadel and will be published soon at PNAS. Where did the colonists originate? It is easy, I understand to detect changes in local population composition, but novely does not necessarily imply direct arrival from the Fertile Crescent. Actually a more nearby origin is likely instead even if there is a chain reaction of sorts. What happened to them after that? One thing we have learned from ancient DNA research is that there was demic replacement in Central Europe most probably with Neolithic but also that there must have been another population shift some time after it. We do not see anything like modern mtDNA pools in the area before the Urnfield Culture (late Bronze Age). What does this mean? Did proto-Celts or whoever genocided not just the Neolithic farmers but also the early Indoeuropeans who had vanquished them first? Why do these people show a type of genetic pool apparently once common in SW Europe (high mtDNA H particularly)? Complex stuff that I do not dare to answer, specially because the evidence is not yet comprehensive enough. Noreen von Cramon-Taubadel1 and Ron Pinhasi, Craniometric data support a mosaic model of demic and cultural Neolithic diffusion to outlying regions of Europe. PNAS 2011. Interestingly the Natufian Mesolithic and the Central European Epipaleolithic (“Mesolithic”) samples are totally off the chart, however all other European Epipaleolithic samples, from West and East are within the box of mainstream Westerness by all measures. However this main group of cranial homogeneity has two clear subsets: one of Anatolian and apparent Neolithic affinities and another that includes all other European Epipaleolithic samples, as well as East European Neolithic ones. Pretty much settling the issue of the origin of Eastern European Neolithic cultures: local development based on occasional contacts, something that was already quite obvious based on archaeology as well (continuity of extended burials with ochre, rustic pottery unrelated to that of West Asian or Central European cultures, high importance of hunt until late dates). Sadly no data is provided for any West European Neolithic, not even Mediterranean Neolithic with the rather unrepresentative exception of a Chalcolithic Sardinian sample. In this aspect this paper is no help at all. Among hunter-gatherers (and Eastern European Neolithics), other than the outliers from Swabia, the main standard is one including SW Europeans (Portugal, West France), a Serbian sample from Vlasac and one of the two Dniepr-Don samples (the one from the Don basin). So we can well talk of a very much homogeneous pan-European type for which the oversampled East Europeans are rather an exception, outliers, yet closer than all Anatolio-Balcano-Danubian-Danish Neolithic peoples. Most danubians (LBK) appear to be directly related to Thessalian Neolithic (Nea Nikomedia) and this one to South Anatolian neolithic (Çatalhöyuk). Eastern Linear Pottery (AVK, Tisza basin) peoples seem to relate best to SE Balcan Neolithic peoples (probably well represented by the Gumelnita Chalcolithic site) and Pre-Pottery Neolithic B of the Upper Euphrates. Some peripheral groups seem rather distinct and may suggest admixture with natives. 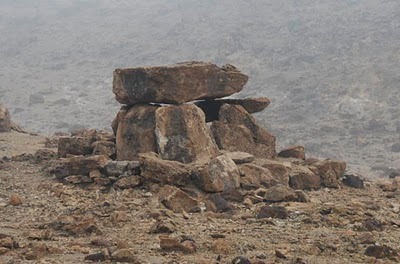 The Körös group is consistently similar to Danish Neolithic peoples of TRBK (Funnelbeaker culture) and this set falls quite apart from the other Neolithic populations in the ME tree, while it falls outside the mains Euro-Anatolian set in the NJ tree. This would be probably best explained if this Hungary-Denmark affinity pre-dates Neolithic. However the only local Paleolithic sample (Vlasac in Serbia) clusters elsewhere, so maybe it means a mixed population after all. In any case I do not think anyone can argue that Körös-TRBK is a purely immigrant population on light of this data. The solid join-the-dots blue and green lines represent most homogeneous Neolithic subclusters of apparent West Asian origin. The nearby dotted areas suggest hybrid populations at the “margins” of this Neolitic demic expansion (yet in some cases such as Körös or Lengyel, they are rather in the middle of all, not truly peripheral). The dashed purple line of course represents the area of aboriginal Neolithic of Eastern Europe, while the dotted purple line around Denmark suggests a highly native but admixed population in that area. I failed to represent the Denmark-Körös connection however. I also failed to represent the grouping of Lengyel, Michelsberger, LBK West, Blicze Zlote and Chalcolthic Sardinia, whose meaning I fail to comprehend (except that they are probably all admixed Anatolian-European Aboriginal peoples). Laos is a state of Indochina Peninsula (also mainland SE Asia) hosting a huge ethnic diversity. As many as 49 ethnic groups are acknowledged nowadays, often divided into lowland (Lao and others, mostly of Kradai languages), midland (Mon-Khmer and others of mostly Austroasiatic languages) and highland peoples (Hmong and others of Hmong-Mien and Tibeto-Burman languages). 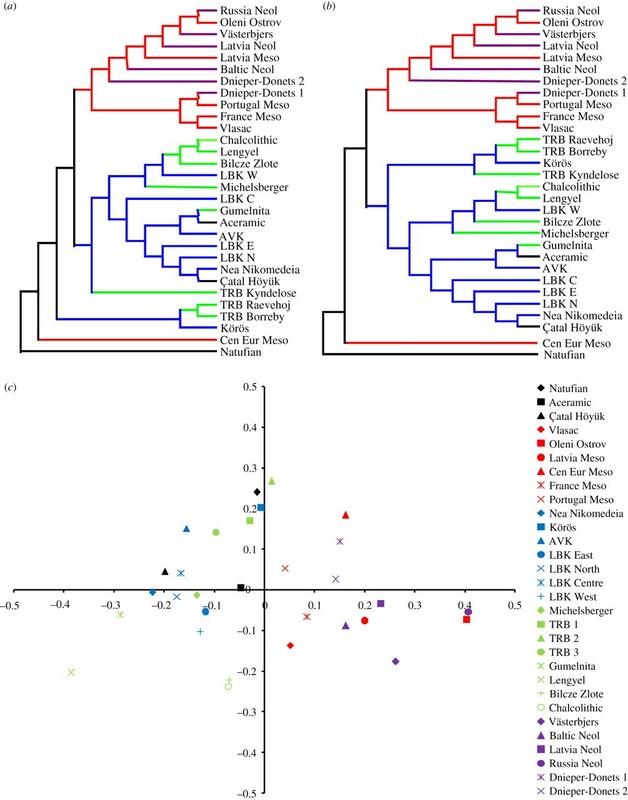 Martin Bodner et al., Southeast Asian diversity: first insights into the complex mtDNA structure of Laos. BMC Evolutionary Biology. Open access. The most prevalent haplogroups were B5a (12%), F1a1a (7.5%), C7 and M7b1 (6% each). Macrohaplogroup N (including haplogroups A, B, F, N and R) comprised 57% of the samples in 37 haplogroups. 26% of the samples were assigned to haplogroup B, almost equally to B4 and B5. 26 out of the 27 haplogroup B5 samples were found to be haplogroup B5a. 22% of the samples belonged to haplogroup F, of which 79% belonged to F1a and its subhaplogroups. Macrohaplogroup M (including haplogroups C, D, G and M) comprised 43% in 27 haplogroups. 32% of the samples belonged to haplogroup M, distributed among ten subhaplogroups. 25% of the M samples, however, remained M*. No maternal west Eurasian or African admixture was detected. 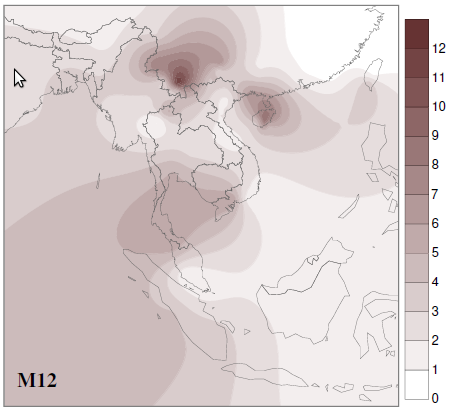 The recently described haplogroup M71 was diverse in the Laos sample. The Laos sample showed mtDNA diversity characteristic of Southeast Asian populations. The composition of haplogroups was in agreement with other populations from this region [3- 7,12,17,23-25,35], with haplogroups B4a, B5a, M7b1, F1a and R9 being the most frequent southern aboriginal lineages. Little Northern contribution was detected. The presence of haplogroups described as Northern (East) Asian [4,6,7,25,36], i.e. A, Z, Y, C, M8a, M9, G2, D and N9, was low in the Laos dataset. 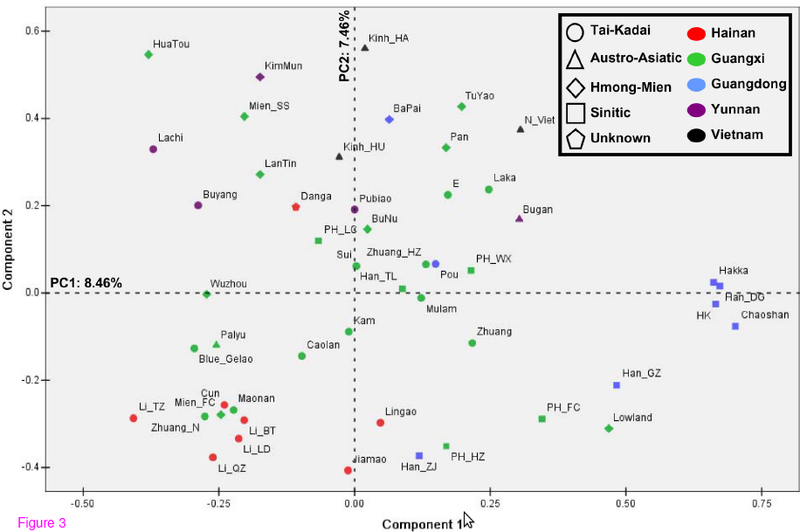 Obviously, the Han population samples did not cluster in the correspondence analysis. Although assigned to the same nationality, they are distant from each other genetically. It was also meaningful to separate the Hmong and Mien population samples , that are usually combined based on linguistics, as they differ genetically (see Figure 4). … the novel basal M haplogroups found in high diversity in the Laos sample and surrounding populations support the fast migration and in situ differentiation model (see Figure 3). … unexpected probably because the assumptions of the authors about the recent demographic history of the region (full of mass migrations towards the mountaintops – what?!) just do not seem to make much sense. Astronomy was clearly important in the lives of the ancients, it seems. 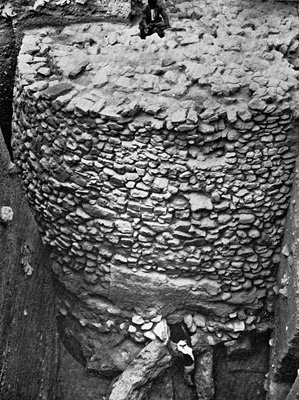 It was at least the case in early Neolithic Jericho, whose seemingly classless society built a stonewall dominated by which was probably the tallest building back then: a tower at least 8.25 m tall (left). Interestingly it has been discovered now that the tower is aligned with the summer solstice in a way that, when the Sun sets that evening, the shadows of the nearby hill envelop first the tower and then the whole town. 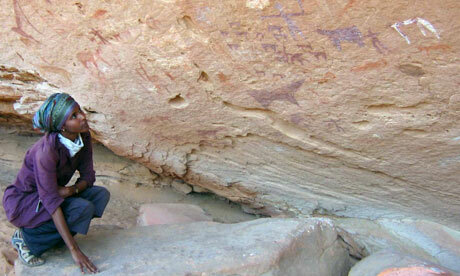 Roy Liran and Ray Barkai, Casting a shadow on Neolithic Jericho. Antiquity, 2011. Freely accesible. Sergio D.J. Pena et al., The Genomic Ancestry of Individuals from Different Geographical Regions of Brazil Is More Uniform Than Expected. PLoS ONE, 2011. Open access. Based on pre-DNA racial/color methodology, clinical and pharmacological trials have traditionally considered the different geographical regions of Brazil as being very heterogeneous. We wished to ascertain how such diversity of regional color categories correlated with ancestry. Using a panel of 40 validated ancestry-informative insertion-deletion DNA polymorphisms we estimated individually the European, African and Amerindian ancestry components of 934 self-categorized White, Brown or Black Brazilians from the four most populous regions of the Country. We unraveled great ancestral diversity between and within the different regions. Especially, color categories in the northern part of Brazil diverged significantly in their ancestry proportions from their counterparts in the southern part of the Country, indicating that diverse regional semantics were being used in the self-classification as White, Brown or Black. To circumvent these regional subjective differences in color perception, we estimated the general ancestry proportions of each of the four regions in a form independent of color considerations. For that, we multiplied the proportions of a given ancestry in a given color category by the official census information about the proportion of that color category in the specific region, to arrive at a “total ancestry” estimate. Once such a calculation was performed, there emerged a much higher level of uniformity than previously expected. In all regions studied, the European ancestry was predominant, with proportions ranging from 60.6% in the Northeast to 77.7% in the South. We propose that the immigration of six million Europeans to Brazil in the 19th and 20th centuries – a phenomenon described and intended as the “whitening of Brazil” – is in large part responsible for dissipating previous ancestry dissimilarities that reflected region-specific population histories. These findings, of both clinical and sociological importance for Brazil, should also be relevant to other countries with ancestrally admixed populations. It is I think quite interesting to realize that racial categories are often meaningless in representing the real ancestry of individuals collectives. This is specially true for the brown (pardo) and black (preto) categories but, in the north specially, it is also very true for the category white (branco). In this sense, the Brazilian census would probably do well dropping racial categories altogether, as they are obviously without meaning. Native American ancestry is rather homogeneous by regions, making up 7-10% of the ancestry except in the North (Amazon) region, where it’s double (19%). African ancestry is somewhat more important and also regionally variable: 10% to 29% (this last in the Northeast). Notice anyhow that the samples were collected in six specific cities and that specially the vast Amazon region is probably under-represented (as the only sample comes from Belem, a large city of the coast). I’d dare say that the vast Brazilian interior (all samples are from the coast) must be stronger in Native American ancestry, even if we do not consider the surviving aboriginal populations, but only the creoles. 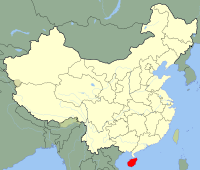 The Li or Hlai are a Kradai-speaking people from Hainan, today a province of P.R. China and the only one which is fully insular (besides the claimed but not controlled Taiwan). However in the Pleistocene Hainan used to be a peninsula and therefore an affinity with mainland peoples was to be expected. Min-Sheng Peng et al., Tracing the legacy of the early Hainan Islanders – a perspective from mitochondrial DNA. BMC Molecular Biology, 2011. Open access. We found that Hainan islanders showed close relationship with the populations in mainland southern China, especially from Guangxi. Haplotype sharing analyses suggested that the recent gene flow from the mainland might play important roles in shaping the maternal pool of Hainan islanders. 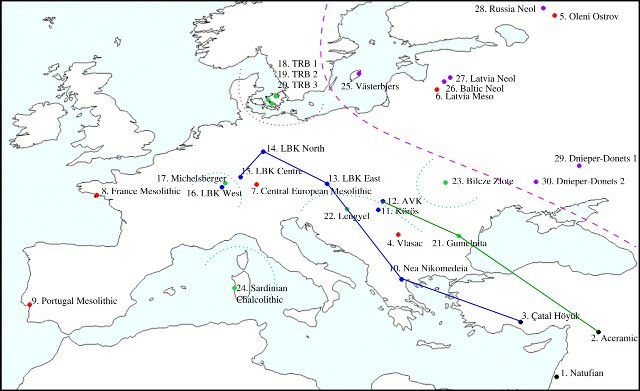 More importantly, haplogroups M12, M7e, and M7c1* might represent the genetic relics of the ancient population that populated this region; and 14 representative complete mtDNA genomes were further sequenced. The predominant haplogroups in southern China and Southeast Asia: haplogroups B, F, and M7 together account for ~ 69%, 71%, and 63% of the maternal gene pools of the populations Li-BT, Li-LD, and Li-QZ, respectively (Table 1). The prevailing haplogroups in northern China, such as haplogroups A, D4, G, and Z, were rare or even absent in the three Li populations. 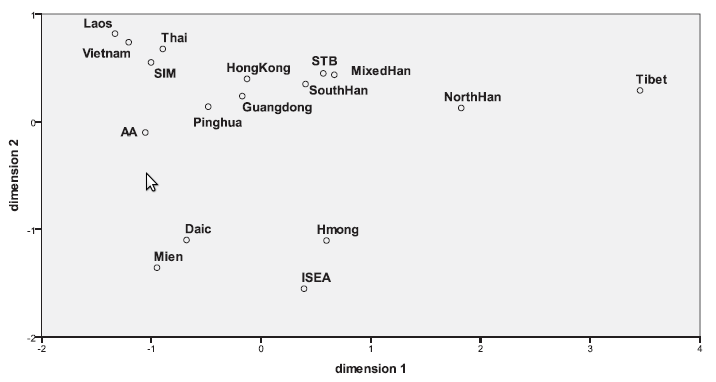 The genetic difference between Hainan islanders and populations from the mainland was statistically significant (p < 0.001, Analysis of molecular variance, AMOVA), whereas the difference between the Li populations (Li-BT, Li-LD, Li-QZ, Li-TZ, and Jiamao) and non-Li populations (Cun, Danga, and Lingao) was not (p = 0.147±0.010, AMOVA). Additionally there are some interesting data mines in the additional files and the figures. Sadly at the moment of me reading the provisional manuscript, most of these figures suffered from critical crop errors and cannot therefore be used (fixed, see below) to illustrate the results of the study.